As part of the Treaty of Utrecht Britain received a thirty-year trade agreement from Spain which permitted British merchants to trade up to 500 tons of goods per year in the Spanish colonies as well as sell an unlimited number of slaves. This process was often hindered by military conflicts between the two nations. In the wake of the Anglo-Spanish War (1727-1729), Britain granted Spain the right to stop British ships to ensure that the terms of the agreement were being respected. Believing that the British were taking advantage of the agreement and smuggling, Spanish authorities began boarding and seizing British ships, as well as holding and torturing their crews. This led to an increase in tensions and an up swell of anti-Spanish sentiment in Britain. Though wishing to avoid war, First Minister Sir Robert Walpole was pressured into sending additional troops to Gibraltar and dispatching a fleet to the West Indies. Wishing to avoid a military conflict, both sides met at Pardo to seek a diplomatic resolution. The resulting Convention of Pardo, which was signed in early 1739, proved unpopular in Britain and the public clamored for war. By October, both sides had repeatedly violated the convention’s terms. Though reluctant, Walpole officially declared war on October 23, 1739. The term “War of Jenkins’ Ear” derives from Captain Robert Jenkins who had his ear cut off by the Spanish Coast Guard in 1731. Asked to appear in Parliament to recount his tale, he reputedly displayed his ear during his testimony. In one of the first actions of the war, Vice Admiral Edward Vernon descended on Porto Bello, Panama with six ships of the line. Attacking the poorly defended Spanish town, he quickly captured it and remained there for three weeks. The victory led to the naming of Portobello Road in London and public debut of the song Rule, Britannia! With the beginning of 1740, both sides anticipated that France would enter the war on the side of Spain. This led to invasion scares in Britain and resulted in the bulk of their military and naval strength being retained in Europe. Overseas, Governor James Oglethorpe of Georgia mounted an expedition into Spanish Florida with the goal of capturing St. Augustine. Arriving in June, he began a bombardment of the city while Royal Navy forces blockaded the port. Seeking to reinforce the garrison, the Spanish were able to penetrate the blockade, forcing Oglethorpe to abandon the siege and withdraw back to Georgia. Though the Royal Navy was focusing on home defense, a squadron was formed in late 1740, under Commodore George Anson to raid Spanish possessions in the Pacific. Departing on September 18, 1740, Anson’s squadron encountered severe weather and was plagued by disease. 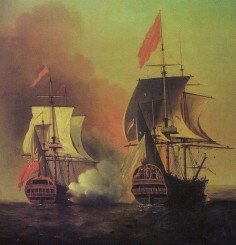 Reduced to one ship, Anson succeeded in capturing the treasure galleon Nuestra Señora de Covadonga off the Philippines on June 20, 1743. Completing a circumnavigation of the globe, he returned home a hero. Encouraged by Vernon’s success against Porto Bello in 1739, efforts were made in 1741 to mount a larger expedition in Caribbean. Assembling a force of over 180 ships and 30,000 men, Vernon planed to attack Cartagena. Arriving in early March 1741, Vernon’s efforts to take the city were plagued by a lack of supplies, personal rivalries, and rampaging disease. Endeavoring to defeat the Spanish, Vernon was forced to withdraw after sixty-seven days which saw around a third of his force lost to enemy fire and disease. News of the defeat ultimately led to Walpole leaving office and being replaced by Lord Wilmington. More interested in pursuing campaigns in the Mediterranean, Wilmington began to wind down operations in the Americas. Repulsed at Cartagena, Vernon attempted to take Santiago de Cuba, but was forced to abandon the operation when he met heavier than anticipated opposition. In the Mediterranean, Vice Admiral Nicholas Haddock worked to blockade the Spanish coast and though he took several valuable prizes, was unable to bring the Spanish fleet to action. British pride at sea was also marred by the damage inflicted by Spanish privateers which attacked unescorted merchantmen around the Atlantic. In Georgia, Oglethorpe remained in command of the colony’s military forces despite his earlier failure at St. Augustine. In the summer of 1742, Governor Manuel de Montiano of Florida advanced north and landed on St. Simons Island. Moving to meet this threat, Oglethorpe’s forces won the Battles of Bloody Marsh and Gully Hole Creek which compelled Montiano to retreat back to Florida. While Britain and Spain were engaged in the War of Jenkins’ Ear, the War of the Austrian Succession had broken out in Europe. Soon drawn into the larger conflict, the war between Britain and Spain was subsumed by mid-1742. While the bulk of the fighting occurred in Europe, the French fortress at Louisbourg, Nova Scotia was captured by New England colonists in 1745. The War of the Austrian Succession came to an end in 1748 with the Treaty of Aix-la-Chapelle. While the settlement dealt with the issues of the wider conflict, it did little to specifically address the causes of the 1739 war. Meeting two years later, the British and Spanish concluded the Treaty of Madrid. In this document, Spain bought back the asiento for £100,000 while agreeing to allow Britain to trade freely in its colonies.